Freedom of religion is one of our most precious democratic rights. It took hundreds of years, including international and civil wars, to establish the right of every individual to freely pursue their religious beliefs subject only to their conscience and to the necessary and proportionate protection of the rights and the freedoms of others. It must be defended against every challenge. Britain today faces a systematic campaign by sections of the media and some politicians, fanned by the BNP, to undermine this right by sowing hatred against Muslims. This has culminated in physical attacks, fire bombings and assaults on women. This campaign constitutes an attack on civil and religious liberties including an attempt to suppress the right of persons of all faiths to dress in accordance with their religious convictions. It must be strongly opposed – as indeed should any attack on the rights of Christians, Jews, Sikhs or any other religious group. It is necessary for all democrats, of all faiths and none, to come together to defend these basic principles of freedom of religion and culture. 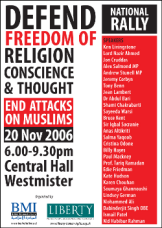 As the first step, faith groups are coming together with all political parties and communities to a central London public rally to defend freedom of thought, conscience and religion and to call for an end to the recent attacks on Muslims. The aim is to develop a national campaign to defend freedom of religion and culture and to combat the rise of Islamophobia. This entry was posted in Anti-Muslim violence, Resisting Islamophobia, UK by Bob Pitt. Bookmark the permalink.